King James was no more sympathetic, Nick Bunker reports in his lively book, a kind of amateur historical picaresque. He called the Puritans, in Bunker’s words, “rash, brainsick, and heady, vain, proud, and pharisaical, ungrateful, fanatical, seditious, and conceited”—worse, he said, than cattle thieves, they were “very pestes in the Churche & common-weale.” He wanted them out. Bunker’s book is haphazard history, and among its many diverting asides is an engaging disquisition on the political science of early modern Europe, which owed perhaps less to the political thought of pragmatists such as Machiavelli than to the “science” of esotericists such as Burton, and Paracelsians such as Joseph du Chesne of France and the Swiss-born English physician Theodore Turqet de Mayerne, whose role at court involved advising their monarchs as much on the body politic as on the body itself. Their Paracelsian worldview—which emphasized the harmony between the individual and his natural environment, and the balance within him of the “essences” salt, sulfur, and mercury—prospered in the early modern court, in which monarchy was understood to be a form of natural order extending from the body of the king. It would have had particular appeal to King James, whose ragged history of poor health Bunker relates in an especially riveting passage—from a childhood sickness that prevented him from walking before age six to arthritis and kidney disease in adulthood. And yet the dissident Puritans were anything but foreign bodies in the unruly Britain of the long and often bloody English reformation. Religious tumult was more or less their natural habitat, and compared with the remaining English Catholics they were in fact quite closely aligned with the established church. The far bigger problem for the Anglican kingdom was not Calvinist agitation but Catholic resistance. As recently as the “Northern Rising” of 1569, Catholic insurgents had taken up arms against the monarchy, and the Gunpowder Plot to assassinate the king had been staged—and bungled—in 1605. The royal response was quite clear: as the British historian Diarmaid MacCulloch has shown, between 1581 and 1590, seventy-eight priests and twenty-five Catholic laypeople were executed for treason; between 1590 and 1603, it was eighty-eight Catholics; between 1601 and 1680, it was at least seventy more priests. The agitation by Puritans was perhaps no less visible, and though their disputes with the Anglican establishment occasionally turned violent—in 1593 three Separatists were executed for sedition, and in the decade that followed some eighty clergymen were dismissed for refusing to embrace the Book of Common Prayer—these were violent bursts in a sibling rivalry conducted largely under one roof. Under Elizabeth, the Archbishop of Canterbury had been a vocal Puritan, opposed by the “Romish” queen, and in 1611 James would appoint a similarly fierce Calvinist to the same preeminent diocese. In the England of James and his successor Charles, religious dissent was not a splinter concern but a general condition. When John Winthrop sailed for America in 1630, confirming New England as a religious refuge for disaffected Calvinists, Parliament was only a single session away from delivering a Puritan fanatic to the throne. The New Plymouth colony was not a commune, Bunker reminds us, but a common stock company—and one that accumulated heavy losses over its first decade, disappointing the London investors who had funded the voyage and the colony, with a financial contract called an “adventure.” “Adventure” is a gentle word for the experience of those who had made the Mayflower journey in 1620. By 1623, the Pilgrims were selling their clothes and bedding for food, and some of them were abandoning their cluster of huts to forage along the seashore for clams and groundnuts. Others hired themselves as servants to local Indians. In his enduring account of those years, William Bradford, the governor of Plymouth, compared the struggling settlers “to the sinful Israelites who ignored the law of Moses and turned to idolatry and fornication, suffering death as a result.” The situation was desperate; the settlement had become what Bunker calls a “squalid failure”—but success lay just around the corner, or more precisely inland and upriver, in the form of the North American beaver. “From the very first they fascinated those who saw them,” Bunker writes, and “in an age obsessed with rank and degree, the beaver hat’s adaptability gave it a special appeal.” As prince, Charles bought sixty-four beaver hats in 1618, fifty-seven in 1619, forty-six in 1623, and forty-three in 1624. “Half the history of England in this period can be found written on the surface of felt hats,” Bunker remarks, with typical enthusiasm. During the 1620s the price of a beaver pelt quadrupled, reaching a peak of forty shillings—enough to rent nine acres of English farmland for a full year. By the mid-1630s, a single beaver hat cost five pounds, more than double the price of fifteen years before. In 1628, more than thirteen hundred pelts from North American beavers arrived in England, and at the peak of the trade in the 1630s, the pilgrims were delivering more than two thousand skins annually. A corner had been turned: the Pilgrims were rich. That country was Robin Hood country: ninety square miles of reluctant land just north of Sherwood Forest in Nottinghamshire, which Bunker provocatively calls the “Pilgrim Quadrilateral.” Many of the Mayflower pilgrims came, in fact, from East Anglia, but the leaders of the expedition—and several significant Separatist leaders who did not make the voyage—hailed from dissident Nottinghamshire, and it is a central contention of Making Haste that the nature of that landscape and its people was imprinted on the character and outcome of the New England experiment. Income was indeed erratic, and prosperity seemed insecure even when attained. (Between 1500 and 1620—the long century that contained the entire history of Calvinist separatism in England—the income of the average English laborer fell by more than half, while in the Quadrilateral farm rents increased by a third in the single decade after 1594.) Sickness was a constant scourge, and in the parishes of the Quadrilateral, the Separatist John Smythe wrote, were found “infinite sorts of sinners…adulterers, Theeves, Murtherers, Witches, Conjurers, Usurers, Atheists, Swaggerers, Drunkards, Blasphemers.” It was indeed an ungodly community, Bunker agrees, suggesting that the Puritans left perhaps less because they felt persecuted by a hostile monarchy than because they were disgusted by the behavior of their neighbors—and their countrymen. They weren’t fleeing England, they were repudiating it. And yet they carried with them, Bunker points out, a very British sense of merchant superiority. Those who led the Mayflower expedition were not the lowly farmers of shabby Nottinghamshire, scratching out a meager living from unforgiving land, but those who looked down on them with newfound disdain—the “self-employed craftsmen and shopkeepers,” the small landowners and proto-industrialists, “the nouveaux riches of rural England.” They did not thrive in wide-open America because their theology implied entrepreneurial acumen, but because they arrived there as entrepreneurs already. Though Bunker acknowledges that “Calvinist zeal was far more important than any other single factor in bringing about the creation of New England,” the success of the colony once established, he argues, was the result of more terrestrial factors. By the time the Puritans reached American shores, their theology was much less important than their enterprising character. Bunker’s book is devoted to the premise that we distort the Pilgrims in our conventional historical accounts, which presents them as embryonic Americans rather than as expatriate British. But in emphasizing their rugged entrepreneurship, Bunker makes the same mistake himself, reading a capitalistic American afterlife into the chaotic experience at Plymouth—and indeed all the way back into the “frontier” of the Pilgrim quadrilateral. The fur trade may have secured the fate of the colony--a story told more authoritatively in Eric Jay Dolin's "Fur, Fortune, and Empire"--but, as Bunker himself allows, the Puritan success with pelts was improvised and inadvertent, and the beaver boom that buoyed Plymouth fortunes lasted only ten years. When it ended, the original Pilgrims and the “Great Migration” greenhorns who had followed them “blundered” into cattle ranching, and found themselves already settled on land — the salt marsh wetlands of coastal Massachusetts—remarkably well-suited to the undertaking. The Pilgrims may have been entrepreneurs—in Scrooby, at Boston—but the success of their colony was not entirely an entrepreneurial one. They got a little help from providence, too. The unfortunate emphasis in Making Haste on pilgrim entrepreneurship, and its pointed disinterest in Calvinist theology, is telling, and natural enough. Though the United States remains in some sense a Christian nation—churchgoing, evangelical, exceptionalist—the strange theology of our Puritan forebears is far more foreign to us, and far more difficult to reckon with, than their scuffling pre-market mercantilism. American religion was not really invented until the nineteenth century, and the expansive denominations that emerged, largely on the frontier, in that Second Great Awakening represent perhaps as profound and complete a repudiation of the Puritans' early modern Protestantism as that Protestantism had been a rejection of the establishment Catholicism that governed Europe in the centuries before Luther. 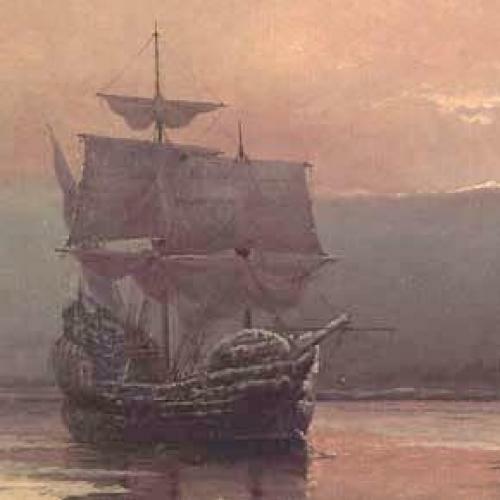 In the severe Mayflower Calvinism of William Bradford and his Plymouth pilgrims, predestination was an inscrutable covenant, piety a gratuity from fear and trembling, and prayer an expression of desperate agnosticism. In the inviting creed of the new American religions, whose triumphal culture we still inhabit today, salvation was there for the taking. All one had to do was claim it. In the spirit of Thanksgiving, we are running some previous reviews about American history. This piece originally ran on July 8, 2010. David Wallace-Wells is the literary editor of New York.